Launched in 2016 by Blavatnik School of Government, the University of Oxford's school of governance and international public policy, Oxford Government Review is a regular publication that each issue focuses on a specific subject. 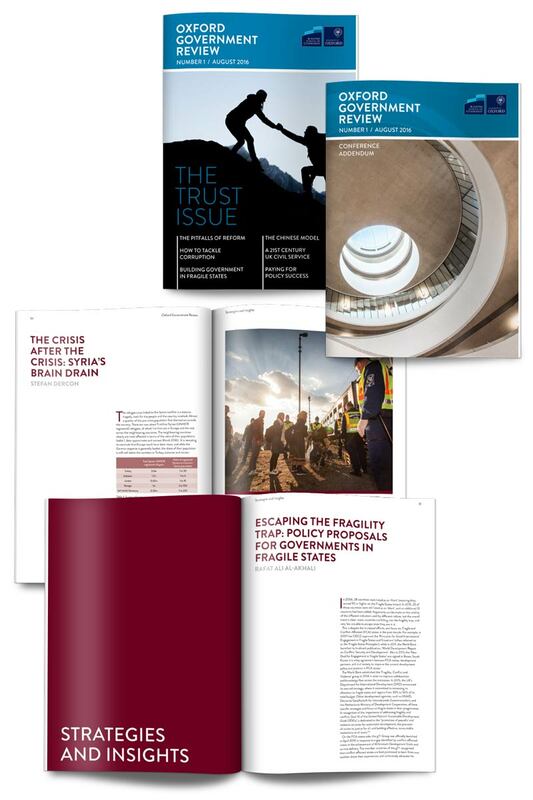 The first issue, covering the trust – or lack of trust – to be found in governments around the world, is accompanied by a 'Conference Addendum' containing overviews from the school's Challenges of Government Conference that took place before the publication's launch. I was asked to create a new brand and visual style for the Oxford Government Review, to fit within the Blavatnik School of Government's wider brand but to work successfully in its own right as a stylish, 'pick-upable' magazine. The appearance is sober and professional, but modern and interesting. I defined and implementing a grid structure for the publication and used imagery in a bold fashion, balanced with strong negative space and careful typography.